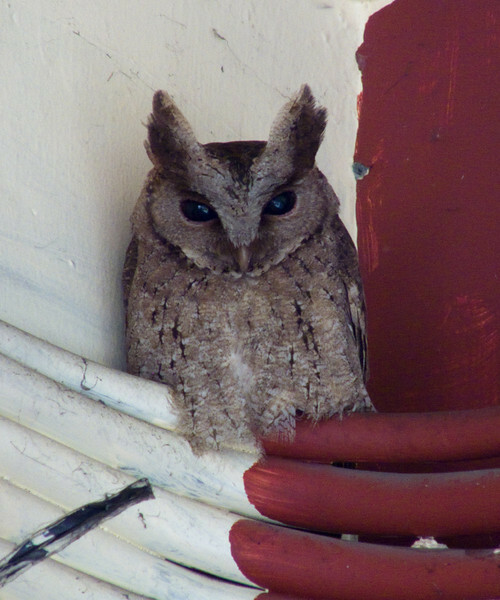 The Philippine Scops Owl complex has been split with the luzon species retaining the name Philippine Scops Owl. In some places it is now called Luzon Lowland Scops. We have seen this species quite often. The UP Scops Owl was the first. It had been hanging out in a corridor of a building in UP (University of the Philippines). When we reached it, there were 3 students taking pictures of it with their cel phones. According to Doc Mando and Prop Jerry, the owl was well and healthy. They said it does leave its spot every so often, presumably to feed. It's nice to know that there are many people in UP who care about this small, endemic owl. There was even a dustpan positioned near the owl, ready to catch the owl poop! We have heard and seen this species in many places. Not all of them were in low elevation. The higherst elevation we have encountered this owl is 5000 feet in Cervantes. We have also seen it a bit high in Sierra Madre near Camp Hamut. But most of the time we are in lower elevation so we have encountered it in many places like Mt. Makiling, In Cervantes we saw a Luzon Lowland Scops in the same place we saw the high elevation Luzon Scops. It seems the have an overlap at around 5000 feet. Quite a common bird that does not mind living near people, we have two pairs in our farm and one that visits our house in Muntinlupa.